What’s DTG Printing and How Does It Work? As you can imagine, the team here at OneHourTees is pretty darn proud of—you guessed it—our ability to print you a fresh, high-quality tee in under an hour. But how do we do it? We don’t blame you for hearing our bold claim and saying to yourself, “A t-shirt in an hour? That’s actually good quality? That’s bogus.” Well, let me tell you something Mr. I Know It All – it’s not! Creating up to 200 amazing, long-lasting tees in under an hour is actually 100% possible—at least if you have the cutting-edge technology like we do at OneHourTees. That technology is a little process called direct to garment, or DTG printing. That’s right. With our skillful designers, badass ninja-like abilities, and some super sweet printing machines, we can make a crazy amount of shirts for whatever your urgent needs may be. That is, if you’re not too bogus. Let’s find out how OneHourTees makes the DTG magic happen. So. What Exactly Is DTG Printing? First off, don’t confuse DTG printing with those cheap, iron-on style transfers of yesteryear. Like we’d sell you shirts that are infamous for fading and cracking after a single wash. Instead, the DTG process is a relatively new printing method that produces incredibly high-quality artwork that will stay put for years to come. DTG or direct to garment is also sometimes called digital garment printing, digital apparel printing, and inkjet to garment printing. If you see those phrases anywhere it’s the same thing, but we prefer DTG. Essentially, DTG printing is a process of printing graphics onto textiles and garments—and most most notably for us, tees. It uses modified inkjet technology to print whatever graphic you want onto the shirt. Think of it like a giant inkjet printer, but for shirts. Rather than printing out boring thesis papers or flyers for your book club, our DTG machines are printing badass dragons jumping through hoops of burning unicorns—or like, a cute lil bunny rabbit for your kid’s birthday. We’ll totally print whatever you want, but we do prefer the badass dragons. DTG printing is a fairly new method that allows for a lot of variation compared to screen printing (which dominated the customized t-shirt market for decades). OneHourTees’ DTG printers can print over 16 million colors directly to your shirt in one single pass. Our ink is completely safe and dries quickly. The ink will soak into your garment itself and become part of the shirt—and not just essentially be a glorified sticker like those old-school iron-on transfers. That means there’s no chance for the graphic to crack, peel, or wash away over time. Pretty darn cool for a t-shirt made in under an hour. How Do You Do It So Fast? With DTG printing, there’s zero set-up time. Methods such as screen printing require individual screens to be created for each color. That alone could take over an hour, and we haven’t even gotten to the printing part yet! With DTG, we get to skip that pesky step and get straight to the fun stuff. As mentioned above, with DTG, the entire design is printed on your shirt in one single pass, no matter the amount of colors involved. With methods like screen printing, a separate pass and screen is required for each individual color. As every screen needs to be individually created and set-up, that adds to the time, and the cost. Though the results of screen printing are stellar for shirts with a limited color palette, that makes designs with lots of of colors at best pricey, and at worst virtually impossible. The biggest joy of DTG printing is how it allows for printing as soon as the graphic has been submitted. Though the literal printing of each DTG shirt usually does take longer than a screen printed shirt—as it’s literally printing out a detailed, full-colored image rather than a series of very large brush strokes—skipping the set-up makes turnaround more or less immediate. Also thanks to the lack of set-up, there’s no minimum order. This makes DTG the best choice for smaller orders. This makes the cost of printing the t-shirt much lower. In fact, you can print a shirt from OneHourTees for only 19.99. The more t-shirts you print, the lower the cost. What Printer Do We Use? Can we just take a second to look at our baby? 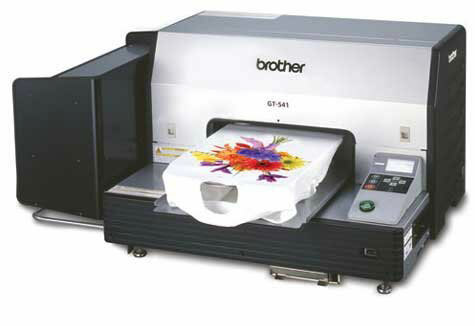 That’s right, our beautiful Brother DTG Printer – GT-381 is the machine that really makes the magic happen. This printer creates super sharp, high-resolution, 1200 x 1200 dpi designs that are certifiably machine washer safe, immensely versatility, and so much more. You can say that we’re simply in love. Why Should I Choose DTG vs. Other Printing Methods? At OneHourTees, we specialize in DTG printing, as well as other printing methods like screen printing, heat transfers, and embroidery. All of our processes will provide you with a high-quality, long-lasting, garment that you can proudly show off for years. However, each method also has its unique advantages and disadvantages. Before deciding on which way to go, consider exactly what your project entails and how you envision the look of your final apparel. With all that said, what does it all really mean? Honestly, that direct-to-garment printing is one lightning fast, super badass way to print awesome t-shirts for a ridiculously low-price. Still unsure if DTG printing is right for you? Hit up the ninjas at OneHourTees by calling us at 773-687-0520. We’d love to talk more in-depth about your project so we can create the perfect shirt. Bachelorette Parties. Family Reunions. Team Uniforms. Air Guitar Competitions. Whatever you need, OneHourTees has the options and the experts to guarantee you’ll get the best looking t-shirt imaginable in no time.